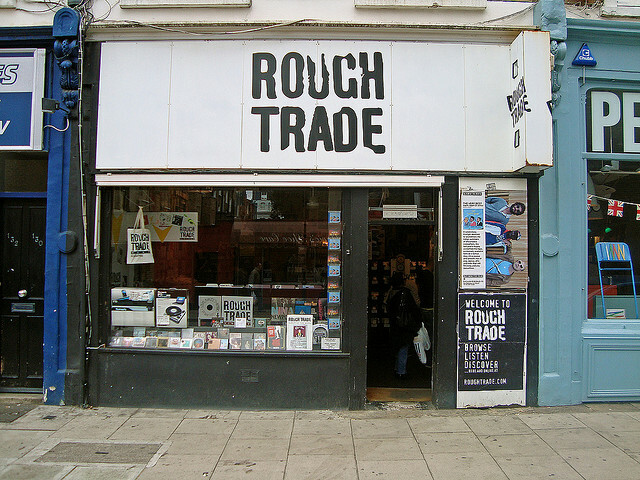 London’s Rough Trade Records shop is an anchor for the independent music scene in the UK. And they have an online presence, too — a good way to support your favorite label in the wake up what for many smaller outlets could be a devastating loss. Photo (CC-BY) Radio Saigón. The first rule of giving is that you need to make sure that the entity to which you’re giving is actually asking for support. In the wake of a devastating fire started during London’s rioting that wiped out a Sony warehouse, indie labels are indeed asking for such support, says a representative of fundraising efforts. Sony’s facility housed, under contract, massive stocks belonging to UK distributor PIAS, representing in some cases the majority or entirety of inventory of dozens of independent record labels. For smaller organizations, insurance funds may not arrive in time to continue day-to-day operation, at a time when small labels are often on the brink of being able to operate from one day to the next. That’s the picture painted by Dan Salter, who tells CDM about the effort Label Love, which in the immediate aftermath of the fire was already communicating with labels and beginning organizing efforts. Along with Hannah Morgan, Dan is leading efforts to help keep the lights on at labels, and to communicate with the rest of us about what’s going on. Updated: An official PIAS-organized fund is detailed below. In addition to providing loans to labels, a statement by PIAS and the Association for Independent Music suggests that the effort will also help coordinate third-party drives like Label Love. CDM: First, who are you? Whom do you represent? Dan: We’re not actually affiliated to PIAS, we are a little group of bloggers & music fans that wanted to do something to help. Have you communicated directly with any labels? What have they told you, if so? We’ve been in touch with a number of the labels. We write & run a number of music blogs so we already knew quite a few people involved but many more have got in touch since Monday. Some of the stories are heart wrenching, people’s whole livelihoods have been put at risk by what’s happened. Insurance will presumably be distributed through SONY. That said, do we know if stocks were covered by insurance? I know that Sony had told PIAS they’re working on keeping stocks flowing. We’re not totally clear on the insurance situation, as you say it might be a question for PIAS, but I do know that even if insurance is paid it may come too late for many of the smaller labels. These companies run on a day-to-day basis and this kind of break in their cash flow could be terminal. What do we know at this point about losses that may be suffered by labels? How are they coping? I’m not sure of the overall situation but we’ve been contacted by a number of labels who have lost pretty much everything & have said it’s very touch and go as to whether they can survive this. Who made the decision to begin fundraising? Was this something that came up via fans of the labels, or that the labels asked for? What’s their response? A lot of these people affected are people know personally and are friends with when we heard the news we responded by thinking about what we could offer as gig promoters and the idea of benefit shows was born. How will funds be distributed once collected? 100% of money donated through PayPal will go to the labels affected. Money raised from the events less costs will also be distributed to the labels. Ideally we want to distribute the money in relation to the percentage of stock lost by each label. If we can’t get the relevant information to do that then we will split it evenly between the PIAS clients. If people want to help now, what are some ways they might do so? How can they give or volunteer? Some people were circulating the idea of buying downloads from their favorite labels who have been affected. Would you encourage that, as well? It’s a great idea but we would encourage people to use independent sites like Rough Trade rather than iTunes or Amazon as they take a far smaller cut & the labels will benefit more. And more broadly, can you tell us a bit about yourself and how everybody’s doing over there? Much appreciated! To be frank, our minds are a little bit blown by the scale of the response to our suggestion. We initially envisaged doing a few small gigs around London, we never expected to be dealing with the sheer volume of offers & support that we have, it’s been amazing & humbling. Right now there’s only a couple of us at the core of this and we work full time as well but we’re hoping to have a team together soon to help us cope with what’s happened! Updated: an official PIAS and Association of Independent Music (AIM) fund has been announced. This morning, we are announcing the creation of a fund to help independents affected by the catastrophe. They will be able to draw upon the fund to help cover the interruption to their business and the cost of getting back onto their feet. The fund is being provided by some of AIM’s larger member labels, other well wishers and from AIM’s reserves, and will be made available to affected smaller labels pro-rata to labels’ [PIAS] turnover this year, as required. Funds will be made available as interest-free and security-free loans repayable within a year. Total initial funds available are £250,000. [PIAS] are first and foremost focused on supporting their labels. AIM will be coordinating the fund, and also other offers of help in the form of promotions and benefit gigs. Source: AIM, via their site musicindie.com. The likes of Mute and Beggars Group also repeat what Label Love are arguing: that smaller and emerging labels may not yet be prepared to whether the immediate aftermath of these events without additional help. The fund would appear to help the cash flow problem.